The 1887completion of the transcontinental Northern Pacific Railroad to its western terminus in Tacoma was a catalyst in the rapid growth of a once small settlement established circa 1865. 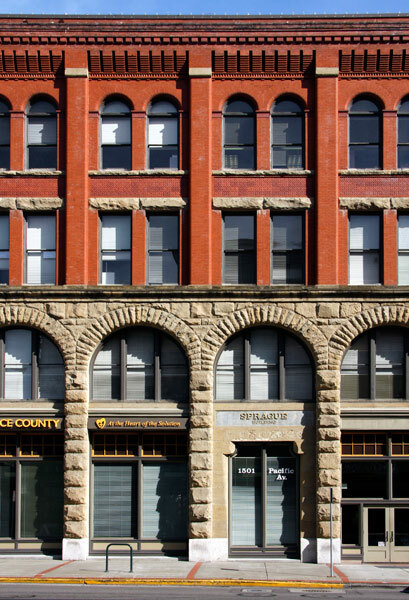 The 1898 Sprague Building was built as an hotel and has been restored as part of the downtown regeneration begun in the 1990s. I took this set of photographs during a day visit in 2010 whilst exploring some of the fine restorations and bold new structures along Pacific Avenue. 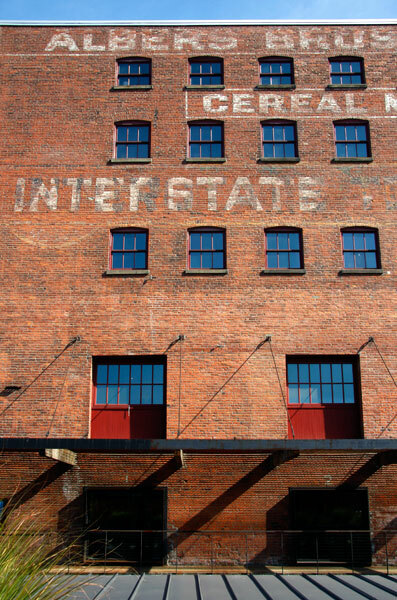 This is part of a longer warehouse block originally built for food, grocery, grain, hay and animal feed companies. A visual twin of the Davis Building stands to the left but the brick façade beyond that differs in its upper floor window outlines and brick detailing. 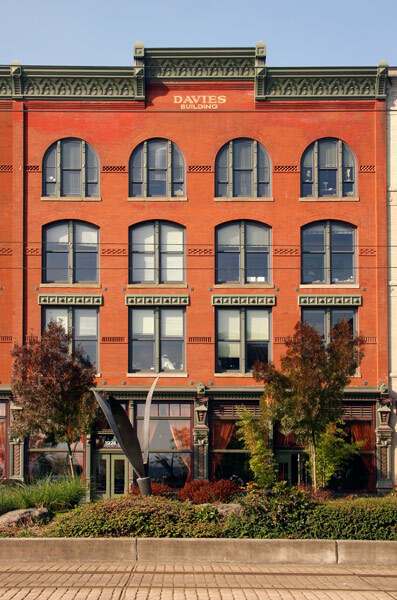 All the upper window frames are in cast iron and the whole block is unified by the uniform cast iron cornice and street-level framing design. I like this architectural style of which this is an immaculately restored example. From its completion in 1904 and its extension in 1912, this brick building was home to the Albers Brothers Milling Company until closure in 1944: it was then used as a warehouse. 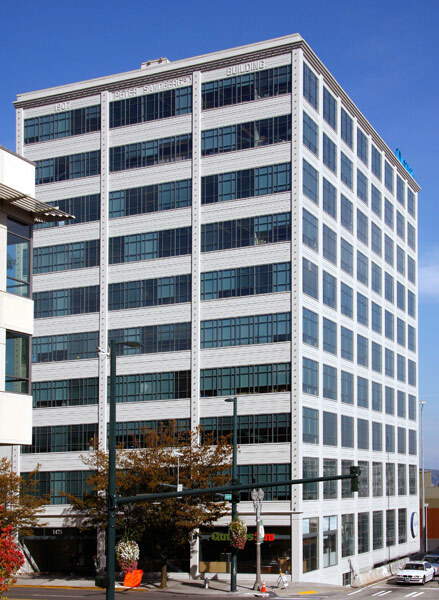 A major redevelopment of the surrounding industrial and railroad area included construction of the immediately adjacent Museum of Glass (Images 09 – 15) and conversion of the Mill to apartments above ground floor art galleries. A new and extensively metal extension was created in a sympathetic industrial style. 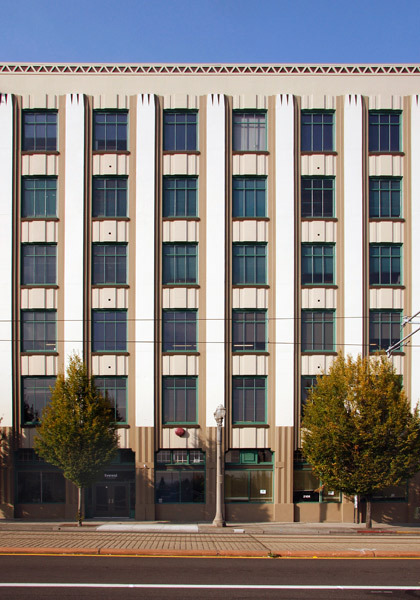 A principal information source on the history of this building was an account, “A Building Reborn”, published by the City Club of Tacoma in the November of 1999 following the building's restoration. 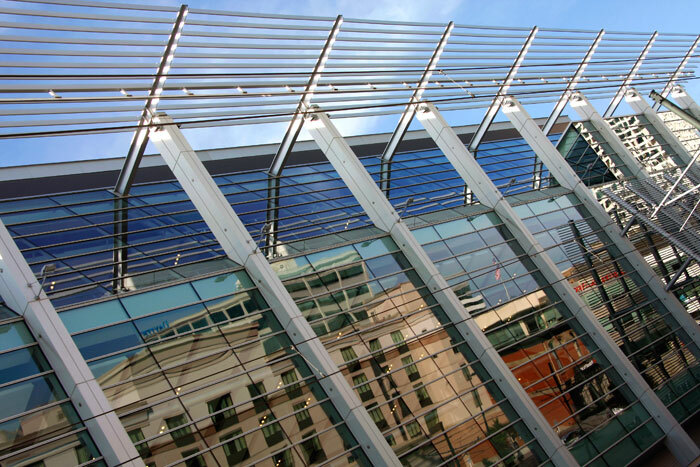 This also included four photographs showing its original 1907 design, exterior alterations in the late 1920s and 1979 and the 1999 renovation and conversion. Peter Sandberg was a local businessman who commissioned architect Frederick Heath (1861-1953) to design a steel reinforced concrete building built to twelve storeys but engineered to carry a further twelve if required. It was then the highest concrete building on the west coast and in style and construction a remarkable contrast to its immediate neighbours such as the Sprague Building of 1898 (Image 01). The building was initially leased to the furnishings firm of Davis Smith & Co until its 1922 sale to L. Schoenfeld & Sons, also in furnishings. They soon painted over the whole exterior supposedly to protect their merchandise from light damage and added an overall aluminium cladding in 1979. Founded in 1848, the business closed in 1996. This fine and remarkably modernist design is now restored to its original form. Earlier in its history Tacoma was the largest centre for furniture making in the United States. Within the city, F.S. 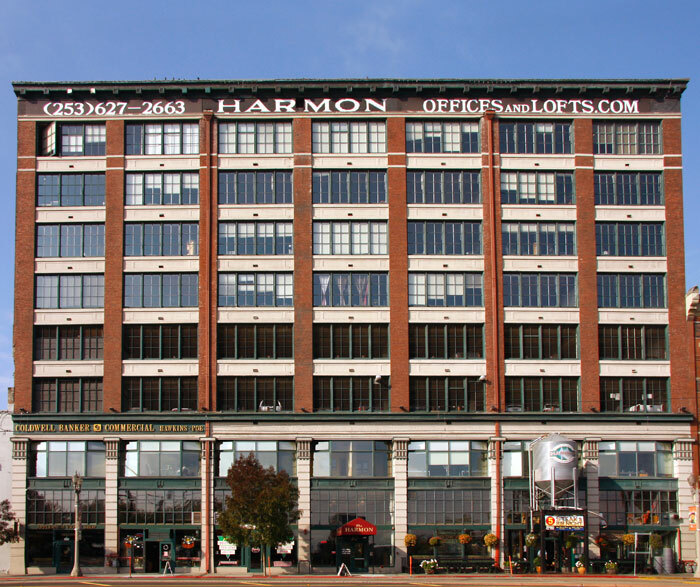 Harmon & Co were initially furniture wholesalers to which manufacturing was added. 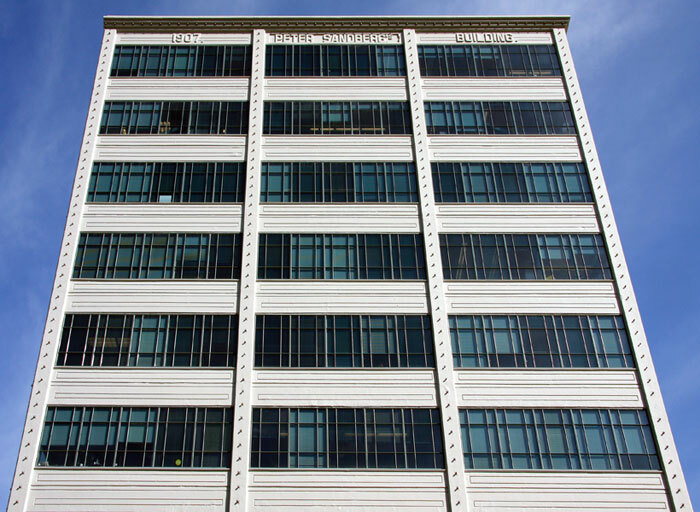 This eight storey building on Pacific Avenue housed their workshops and showrooms until closure in 1960. In the late 1990s the building was converted to loft apartments and commercial premises. The original Tacoma Grocery Co Building was centred in a block of three standing towards the eastern end of Pacific Avenue. All dated from c1906 and presumably all were built in the brick that survives in the flanking pair. This Art Deco reconstruction dates from the 1930s. Like many other warehouse buildings in the area it has been restored and converted to meet contemporary needs. 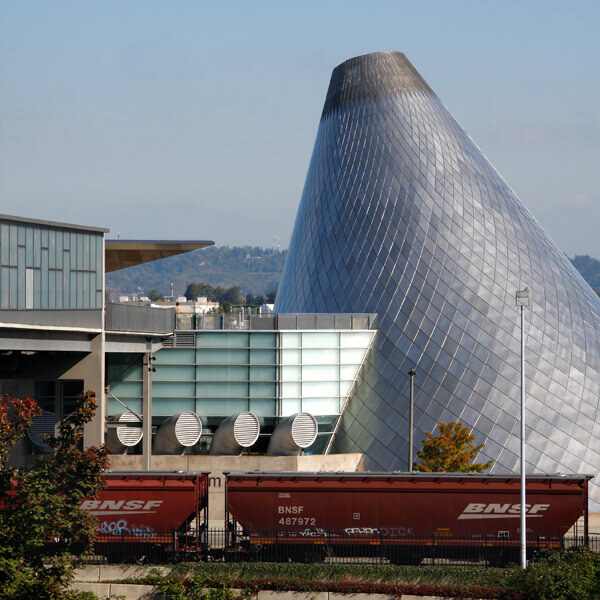 A Canadian architect, Arthur Erickson, led the Museum of Glass design team. The main Museum buildings are to the left whilst the hot shop is housed in the ninety feet high stainless steel cone. Comprehensive exhibition and educational programmes operate and one can watch glassblowers at work. 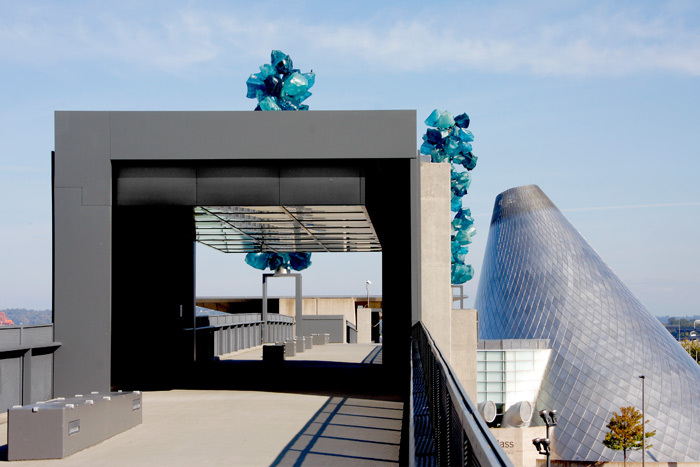 The Bridge of Glass walkway links the Museum to this camera point on the Pacific Avenue terrace of the Washington State History Museum. 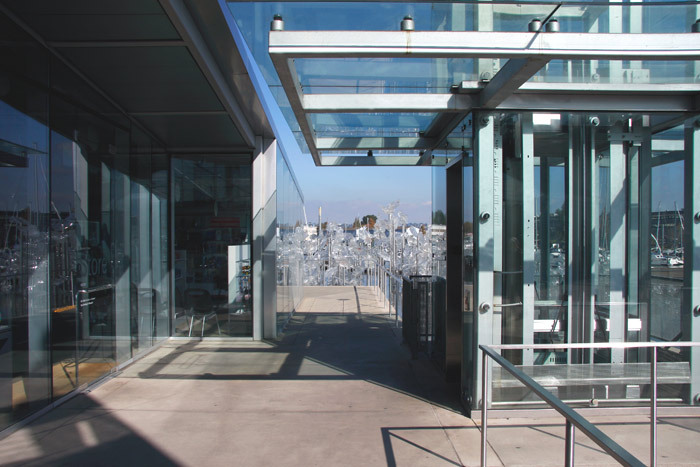 After crossing the Bridge one walkway reaches a large sculpture terrace carrying extensive water pools framing glass and other installations: a fragment of one can be seen through the building detail in Image 11. A wide stairway sweeps around the base of the hot shop cone to link with the waterfront and Dock Street from where this photograph was taken. 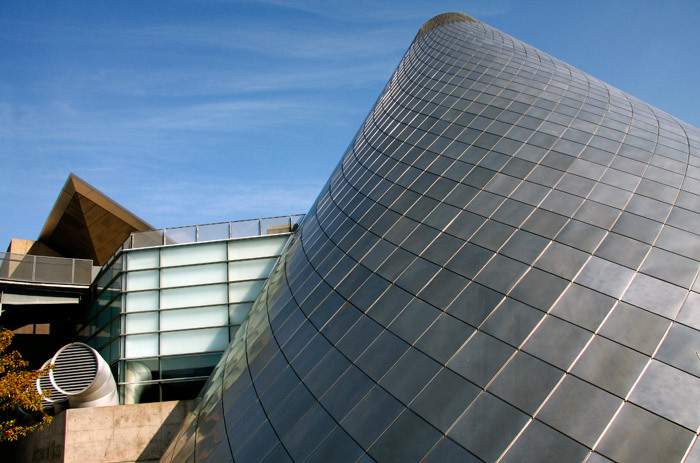 Britain's National Glass Centre in Sunderland is quite close to my home and like its Tacoma counterpart combines a hot shop with working studios, exhibition spaces, and a gallery shop displaying glass from across the UK. 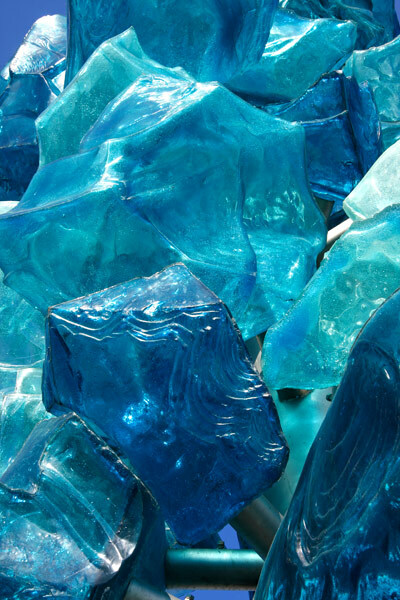 Hot and cold glass courses operate for beginners and beyond and are open to anyone to join. Glassmaking in the City dates back to 674, with large-scale production of window, bottle and ornamental glass developing from c1690. On the Bridge of Glass, this Seaform Pavilion has over two thousand pieces of blown glass from Dale Chihuly's 'Seaform' and 'Persian' series contained within a dual-skin glass roof: a detail follows in Image 13. A second 'Venetian Pavilion' displays over one hundred glass sculptures in a wall of individual cases. Daylight and fibre optic lighting in both pavilions irradiates these often-complex forms and the patterning and colours they contain. 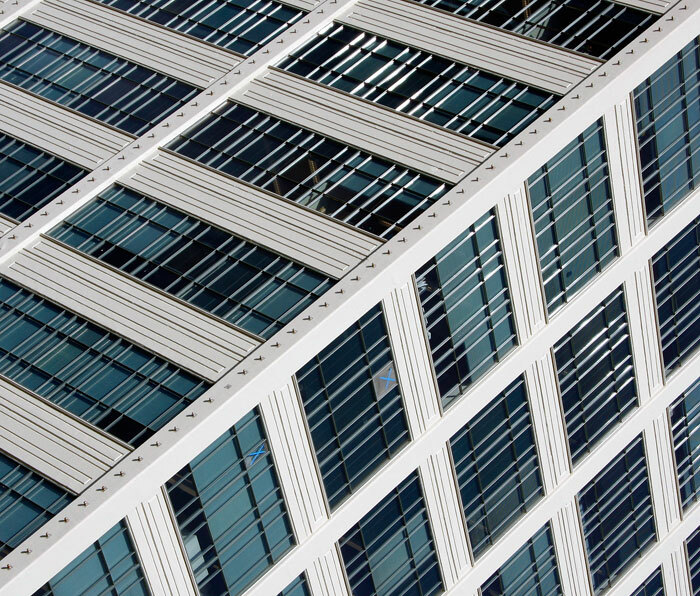 This is a detail outlined by one frame in the twenty -four panel metal grid supporting the Seaform Pavilion glass roof. Lying flat on the ground was the best position from which to view and photograph. I have long appreciated the artist's remarkable creativity and technical virtuosity in hot glass and his related large-scale colour drawings. 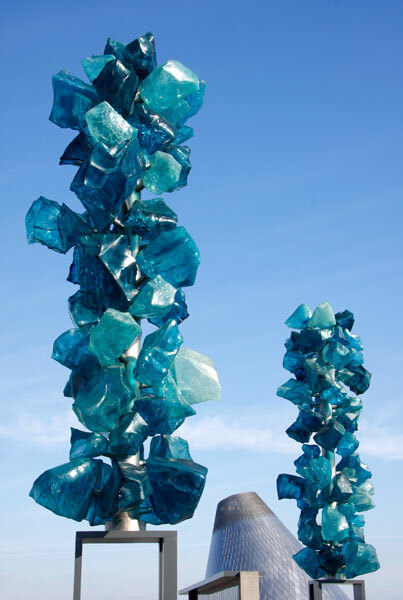 Dale Chihuly was closely involved in developing the design of the bridge and its Pavilions and to which he also contributed the two Crystal Towers. Tubular metal stems carry the individual forms cast from a polymer-based material that he uses for some designs where its properties, including a lighter weight, are more appropriate than glass. 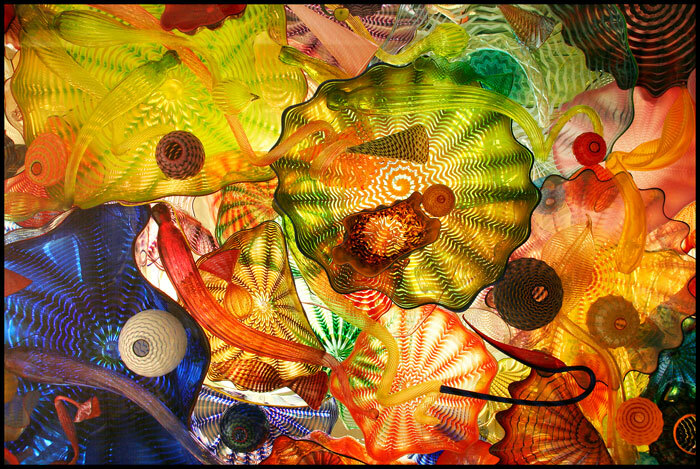 The Dale Chihuly website contains a comprehensive resume of his work, exhibitions programme, installations and publications. 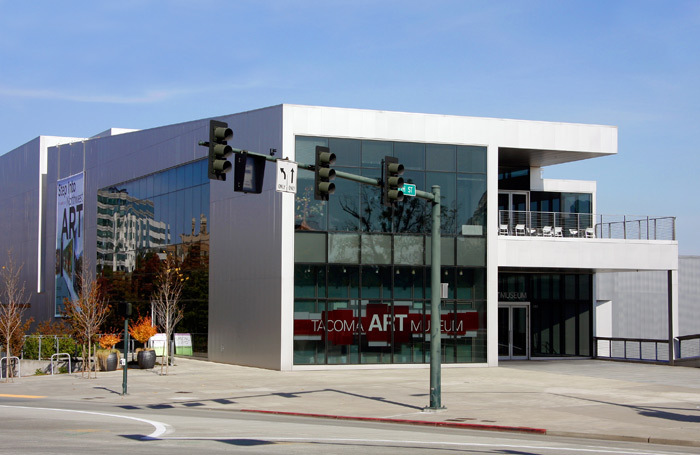 In 2003 the Tacoma Art Museum took possession of this new building designed by Antoine Predock, its fourth home since foundation in 1935. Displays are created from a permanent collection, loan exhibitions and a changing programme involving artists and designers from the northwest. The traffic light structure was a visual irritant at the time but in the image it now seems a suitably sculptural addition to the Museum forecourt. My visit coincided with a downtown 'meet the Tacoma Firefighters' equipment display and demonstrations of which the orange crane truck was part. 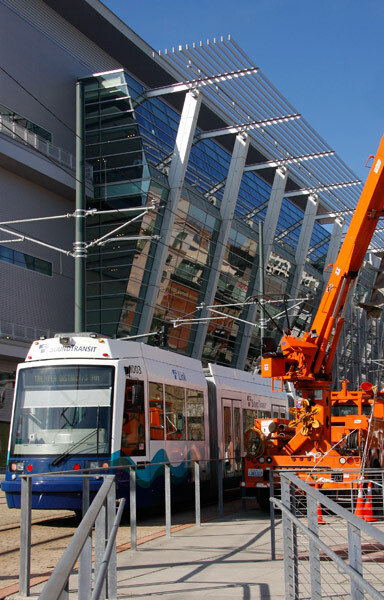 It seemed appropriate to combine it with the railings, street tram and the engineering structure of the Trade Center. This building is to a design by Mulvanny G2 Architecture, an international practice dating from a 1971 foundation in Bellevue some sixty miles north of Tacoma. It's a large structure and there was no time for me to explore in changing light across the day: I'd like to re-visit the building to make a more considered response to it and to the city architecture in general.